UPDATE: The relatively new blog, Nextlex notes these FREE PLI webinar resources on foreclosure law and predatory lending. 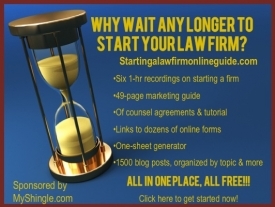 In both my book and on this blog, I’ve written that pro bono training programs offer one of the cheapest and most effective ways to get up to speed on matters that you might handle in your law firm – such as probate, divorce, public benefits, bankruptcy or wage and hour law. Most pro bono trainings are staffed by top local experts, who are often willing to provide follow up guidance if you later need assistance on the topic. And once you’ve handled one pro bono matter, you can truthfully tell clients that you have actual experience with a particular kind of case. on one of today’s hottest practice areas: foreclosure. In fact, the Chief Judge of the Maryland Court of Appeals is calling on local attorneys to take on a foreclosure matter pro bono. But once you’ve done that, there’s no reason that you couldn’t handle these cases for a fee. I’ve signed up for the course, not because I have any interest in starting a foreclosure practice, but because I can do my civic duty as an attorney and learn something completely new at the same time. If you’re licensed in Maryland, I hope that you’ll join me in this unique chance to do well by doing good.